Welcome back guys! 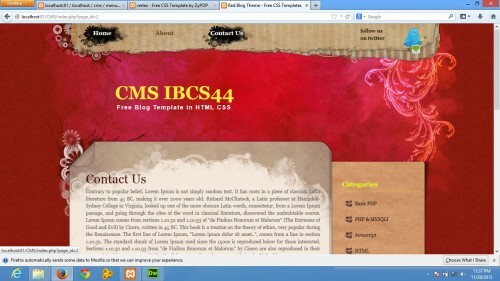 In the first article of this series I show you that how can you make a simple (html & css) template useable for CMS. And make menu & categories dynamic. 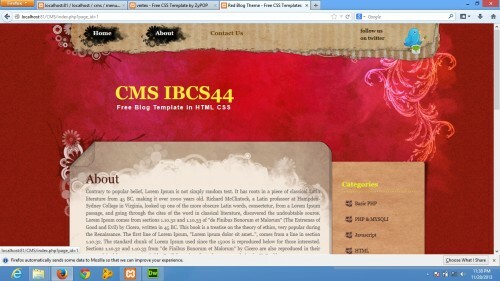 Now I wil try to explain how you make dynamic content for menus & categories. So let’s start. In our menu table we nake a column “content”. When we click on “About” it will display the related content from database into index page. When we click on category like “Basic PHP” it will display all articles which are posted under this category. Now we need to make a new table “articles”. Int cat_id column we add the category id like if the article is related to “Basic PHP” we enter cat_id = 1. Because in categories table “Basic PHP” id is 1. Ok come back to menu. When we click on “About” or “Contact Us”, in index.php view the data from “content” column respectively. In here inside the red box code we declare a variable menu_id & we assign id of that menu in that variable. When we click on “About” in url we see “index.php?menu_id=1”. That means it take the “id” of that menu. Now our job is to display the content of that menu in content page. In content page we need to receive the “id” and we use a method to read the content. We use a method called readContent() which take 2 parameter “menu_id” & “table”. In if(isset($_REQUEST[‘menu_id’])) that means if $_REQUEST which is a global variable is set by “menu_id”, means if we get “menu_id” from url then do the following instruction. If it returns true we extract() the mentod result. This readContent() method return us a single record from the table. Because u filter the result by a unique id. Using the extract() method we convert all index into a variable. Now we can call all column heading in our desire location. Our output will be look like this. So, we can display all our menu content in our index page. Lets do something on Categories. As the same way we pass the id of a category through url in “cat_id”. Here we find something new. We use foreach loop here. Because under a categories there may multiple articles. When we click a category we need to retrieve all the articles under that category. And then we use extract(). After that we place our variable in our desire place. All articles retrieve from “articles” table. Look in content we try something new. We make an array using explode() function. Separate all word depending on space(“ ”). All the word in content now in an $arr array. Now we use array_slice to take few word from that array. We take index 0 to index 50. Now we add all the slice array using a space(“ ”) using implodeI() function and then print it. We do that because we display few word from every article and use a “read more..” link to read full article. In here we also pass a id if that article. 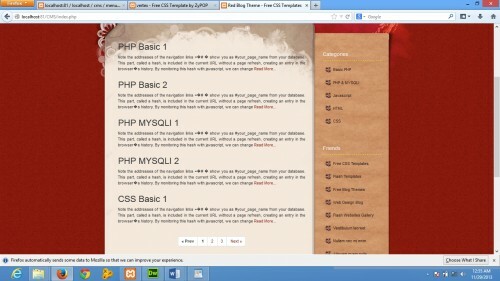 When we click on that article full article will display in content.php. Now we want to display all articles in our home page. When we load the blog all articles will be displayed one by one. 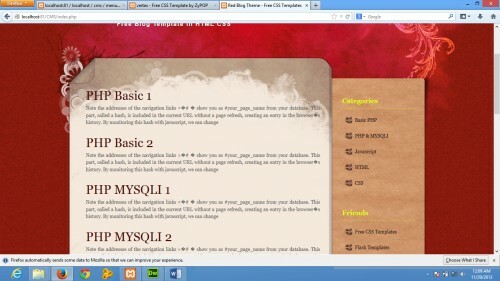 Now refresh the index.php page you will see all the content in your home page. I think something wrong in there. Am I right? May be you people don’t want to watch all the articles in home page. So we need to display limited articles in home page and make pagination. 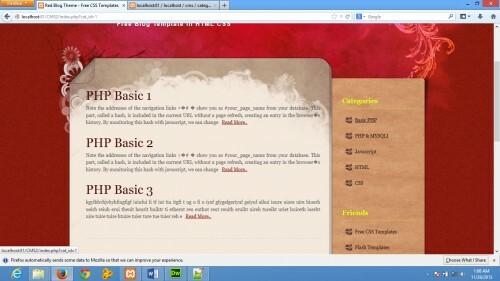 Yea, now we are going to make pagination in our content page. Let’s start. Now Refresh the index.php page, it will display first 5 articles & the bottom display the pagination. So finally our pagination complete & also end of Part-2. Hope this will helpful for you. really this z very help full for php develpors.thanku somuch.